With a day off Friday, we blast off for the Space Center just south of Houston. The Center has been updated quite a bit since my last visit and Storm has never been here so he is looking forward to the trip. 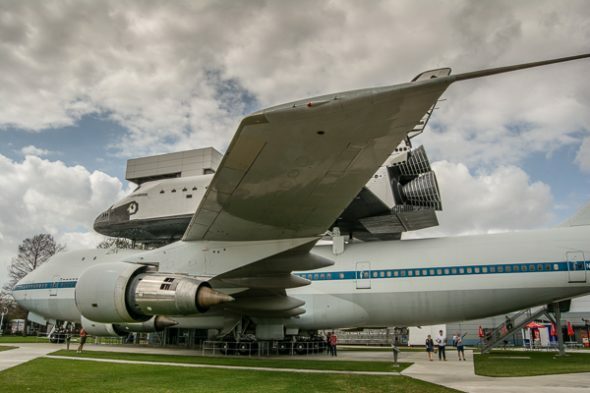 Our favorite display is Independence Plaza where a shuttle mounted on the SCA (Shuttle Carrier Aircraft) 747 can be toured from top to bottom (or vice versa). From a pilot’s perspective I think that the guys who flew the carrier aircraft were amazing. They were not allowed to fly through rain, turbulence or anything that might damage the shuttle. They had to precisely plan a route that avoided those things while dealing with double the fuel burn of an airliner. On top of that, they had to grease a landing with another airplane mounted on top of them. I am impressed! After a brief scuffle with a young photographer who in spite of our objections futilely insists that he must take our picture in front of a green screen before we can take the NASA tram tour, we finally board the tram for a visit to the Historic Mission Control Room used for the Apollo Flights. (Note: the pictures are not for security but to coercively sell souvenir photos as folks return from the ride.) 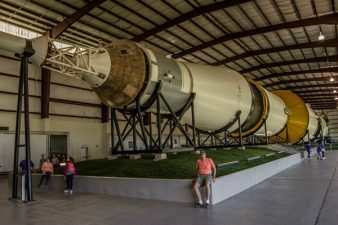 The tram excursion gives us a quick overview of NASA grounds, then we are dropped off in Rocket Park to tour at our leisure the large building which now houses a fully restored Saturn V rocket. 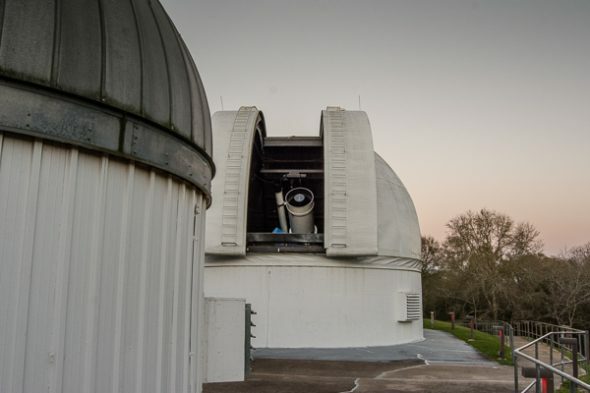 After work on Saturday we rush off to Brazoria Bend State Park to catch the George Observatory star gazing event that occurs each Saturday night from 6pm – 10pm. The moonless, dark sky is perfect for viewing, but the admission is a little pricey for an evening outing as they charge $7 per person to enter the park and $6 per senior to look through the telescopes. Here is a money saving tip: Don’t pay and wait in a long line to look through the big telescopes. On the patio surrounding the big scopes, amateur astronomers set up multiple smaller telescopes pointed toward the same stars, nebula and planets as the larger scopes. There is no charge to look through the amateur’s telescopes and the view shows just as much detail as the larger scopes (at least to this untrained eye). As a bonus, the owner’s are very knowledgeable and eager to explain what you are seeing. While we are here, a Planetarium speaker gives a presentation using his super duper laser pointer (we ask and learn that astronomers can legally point them skyward) to direct our eyes toward amazing stars and planets as he explains the significance and history of each one. On our visit we see the Owl Cluster in the Cassiopeia constellation, the Orion Nebula and the crescent shape of Venus as it passes between the Earth and the Sun. As for Brazoria Bend State Park we hope to return in the daylight to explore this park which is billed as a “Nature Lover’s Paradise” and from what we were able to see driving in appears to be a lovely and spacious place to visit or camp.